After a wonderfully slow morning at the guesthouse watching the famous tango scene in 'The scent of a woman' we packed up and checked out. We envisaged a fairly slow paced morning, as the bus wasn't leaving until 6pm. So we posted a few things home, sorted out money and had a little snack before deciding to find the T.A.T to get our tickets for our holiday. What a bloody stressfest! As the tuk tuk driver had taken us and explained that it was the best T.A.T in town, neither of us had thought about getting the address for the place. We thought it would be fairly easy to find the T.A.T near Khao San Road. So we started walking. And we walked, and walked and walked. A couple of hours later we were no closer to find it and much more freaked out. The night before I had made the error of reading a few articles in our travel guide about shysters and people getting scammed in seemingly official travel agents in the Khao San Road area. 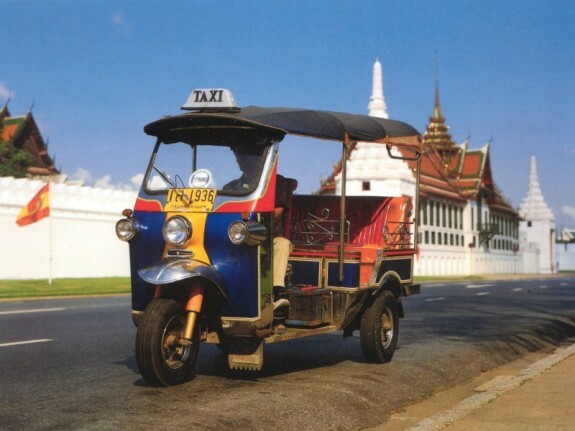 They are usually taken there by friendly tuk tuk drivers and as soon as money exchanges hands they couldn't care less if you go on the holiday of a lifetime or not. By this point in the day poor Pops was on the verge of tears and I was trying my best to think of a way around the mess. A 'policeman' tried to help but we soon ran away, an agent in another T.A.T office told us it would be like looking for a needle in a haystack. He showed us what our receipt should have looked like... which it didn't. We were really starting to lose it until I got a brainwave. Poppy had paid for the whole thing on her credit card. We should have had a credit card receipt. Surely at least that would have had an address on it? After a lot of scavenging we FOUND IT! We had an address, we got a tuk tuk to take us and as soon as we got there our agent had a pile of neatly arranged and very official looking receipts to give us. I don't think we could have felt more relieved. I just felt better seeing Poppy's shoulders come down from around her earlobes where they had been for the last three hours. We walked the short distance to Khao San Road and we decided to treat ourselves at 'Swenson's' - the most amazing ice-cream shop in the world. Poppy and I shared an Oreo Cookie Sundae and let it melt the day's stress away. Rather than get lost again we settled on going back to the guesthouse to drink an ice-tea, swap our books and wait for our pick up. I swapped a couple of books for the Jim Thompson story - the American who started the Thai Silk Industry. An apt and interesting read I thought. At 6pm on the dot we were picked up from the guesthouse and chauffeured to the most confusing bus stop I have ever been to. There were three buses, no signs and after queuing haphazardly and chasing a ticket officer for a couple of stickers we managed to get a seat in the V.I.P section of the bus, only then to be rammed in and ending up with less space than if we had just gone upstairs with the rest of them. We waited around for about an hour or so but as soon as the rain started we were off. Bye Bye Bangkok!